In 1999, the Rahim siblings came together in Oakland, California to form Numi Organic Tea. The company�s hallmark is organic and Fair Trade Certified teas and herbal teasans made with 100% real ingredients. 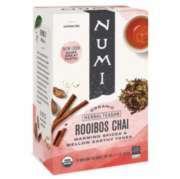 Numi manufactures and distributes its tea in biodegradable, filter-paper tea bags, which are packaged in recycled boxes printed with soy-based inks without plastic wrappers. 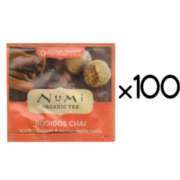 We carry a wide range of tantalizing Numi products including chai, mint, green, rooibos and pu-erh teas. Available in single serve packets.